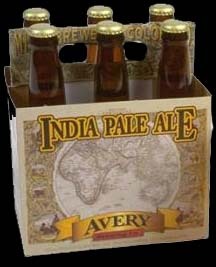 The IPA pours a cloudy amber color and settles to a light amber color with a clear body. After a short period of time, the body became hazy. The massive, off-white fizzy head almost overflowed the glass and has great lacing. The nose detected a strong presence of sweet hops with hints of grass. This hoppy aroma was rather harsh, but in a good way. The initial moderate biter taste had a healthy hop presence and was followed by a strong presence of malts for a mildly bitter finish. We were quite pleased with this very balanced beer. The light to medium body has a strong carbonation presence and leaves an oily texture on the palate. Comments: WOW, I can smell this from here – Ian, right after opening the bottle. Reviewed on January 11th, 2007.